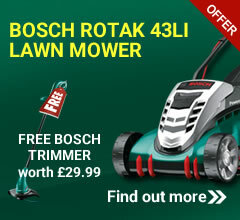 Buy this lawn mower and receive a free bottle of Honda 4-Stroke Engine Oil (0.6 litres). Bundle deals also available. This machine will be set up, pre-delivery inspected and tested by our Honda trained technicians prior to being delivered to you. 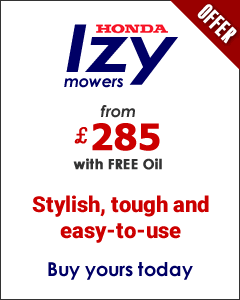 The Honda HRX 426 QX lawnmower features a powerful and reliable 5.5 hp Honda 4-stroke engine along with the peace of mind of Honda's unique Roto-stop safety feature, enabling you to stop the blades without the need to stop the engine. The cutting height can be altered with a single lever. It is a fast and simple matter to move the blades up or down to achieve an even cut at any height - you may want longer grass in a rough area, for example, and a shorter cut for the lawn. The Polymer deck is a hard-wearing innovative material that allows Honda to design extra durability into their machines while reducing the overall weight at the same time. Safety is a paramount concern in everything that Honda build. The Honda HRX 426 QX lawn mower is also fitted with a roto-stop clutch which allows the operator to empty the box whilst leaving the engine running and also allows you to drive the machine from A to B without the blade running. With the unique Roto-stop® feature (now available on most models), when you let go of the handle, the engine continues but the blades stop - so you can leave the engine running while you empty the grass bag. The HRX 426 QX a rear roller give your lawn that classic striped effect. A rear roller offers greater machine balance and control when cutting around the edge of your lawn. The Honda HRX 426 QX utilises Honda’s Roto-stop® technology. It’s a safety feature that allows you to disengage the blade without having to cut the engine. That means you don’t have to stop and restart it every time you go over a gravel pathway or when it’s time to empty the collection bag. Roto-stop® is operated via a hand control button positioned on the HRX handle. For a greener lawn you have to get the cut spot on. You should only cut a blade of grass one third of its length for healthier growth. The adjustment is easy with the HRX 426 QX lawn mower. Simply take hold of the handle and press the release button. You can then lower or raise the deck evenly over all four wheels for an accurate cut. Once you’ve got the height absolutely right for the length of cut your lawn will start to look and feel much better, for longer. There's another benefit to this too – you won’t be constantly stopping and emptying the bag by cutting more than you actually need to. Self-propelled - The engine drives the mower forward, taking the effort out of lawncare. Polystrong® deck - Durable and rust-proof polypropylene deck allows us to design in extra strength while reducing the overall weight. Rear roller - Give your lawn that classic stripe. A rear roller offers greater machine balance and control when cutting around the edge of your lawn, too. Roto-stop® - When you release the handle, the engine continues but the blades stop – so you can leave the engine running to empty the grass bag or drive across gravel paths with complete safety and peace of mind. Folding handle -Quick and simple folding for easy storage and transporting. 8" wheels - New tread design and a softer compound material for rock-steady operation. Honda premium mowers (used in a domestic environment) come with a 7-year warranty (subject to an annual service). 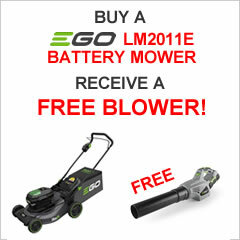 Take the hard work out of buying your mower online with our exclusive Start 'N' Go premium service - only £15.00 - Please see buying options above. Perhaps you’re not mechanically-minded, or maybe you just don't have time to assemble your new machine. If that's you, then we offer Start ‘N’ Go. With Start ‘N’ Go, we will unpack, build and test your new machine, then when we are happy that everything is working perfectly, we will repack it, put it on a pallet (not a white van) and deliver it to you safely & securely, normally within 2-7 working days. I took a long time to choose the mower for my needs. The Honda was just what I needed and has not disappointed. It was delivered quickly and courteously.